Thank you to the Container Store for sponsoring this post. All opinions remain my own. It's not the easiest thing to admit when you aren't the most organized person out there. 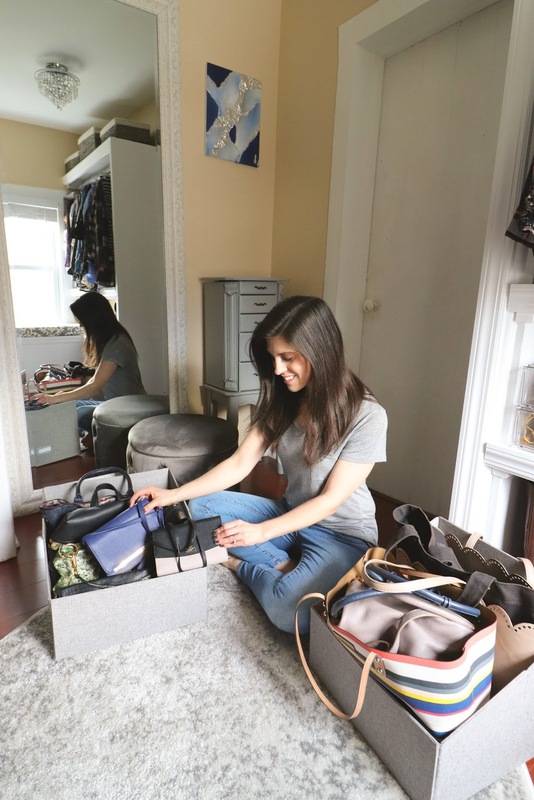 It's not that I purposely set out on a journey to be disorganized, but sometimes life happens and those things you wanted to tackle get pushed to the back burner. That's what happened with my master closet. 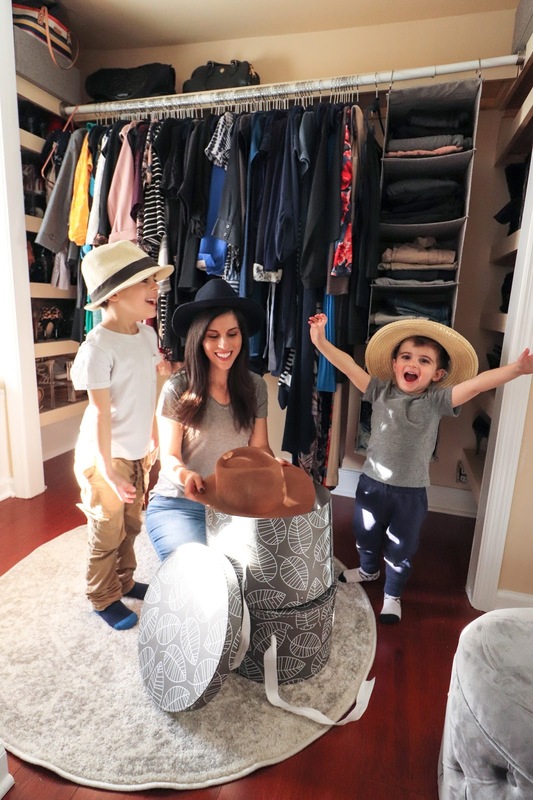 Let me back up for a second, if you've been following my blog for awhile, then you know my lack of closet space in our home has been a big issue. I can't complain about the size of my master closet, but that's also because Eric built it for me. 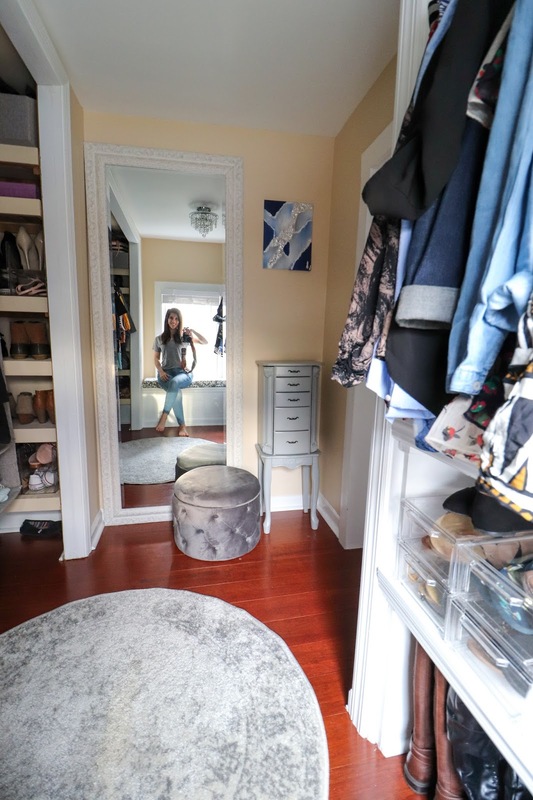 After opening up some walls, re-configuring our master bedroom, and turning what we think was a previous bathroom into my now closet, I can finally say this space feels like a dream. I'm a little embarrassed to show you the before pictures, but here we go. I think my closet really became a dumping ground for so many things. 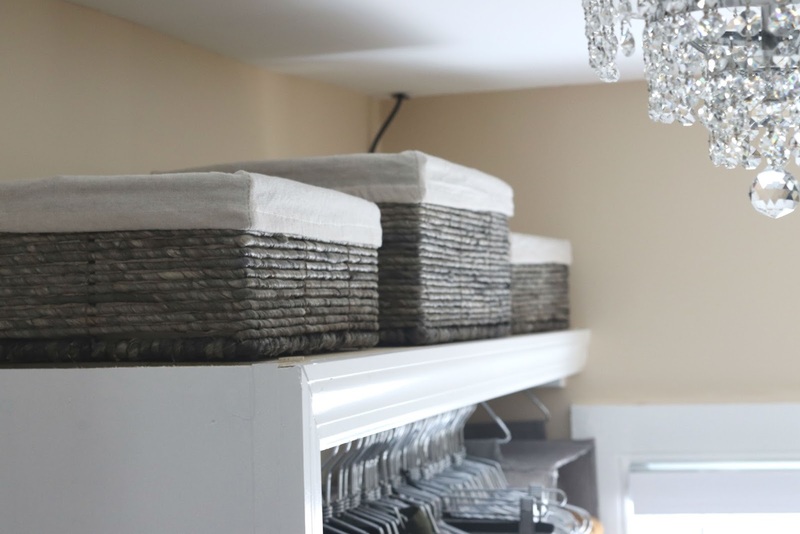 I would keep baskets of laundry in here that needed to be folded, an overflow of my clothes because I didn't have enough hanger space, and would hide things like Christmas gifts and all kinds of random things that would make their way in here. To be honest, I didn't really enjoy going in here because it felt overwhelming, even though I knew deep down it had the potential to be an amazing space. 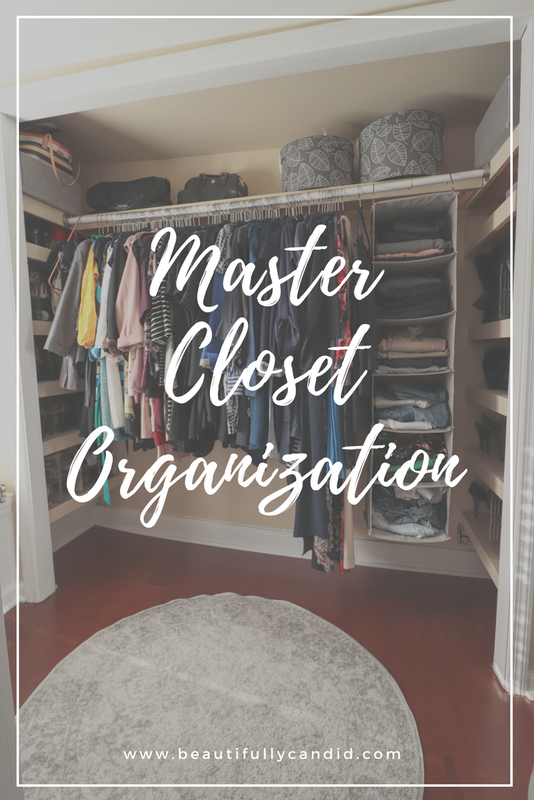 When the opportunity came about to get things organized, I don't think I could type fast enough that my master closet would be the room I would focus on. I think this was the exact push I needed to really get everything in order. I truly embraced this whole project and ran with it even further than I expected. 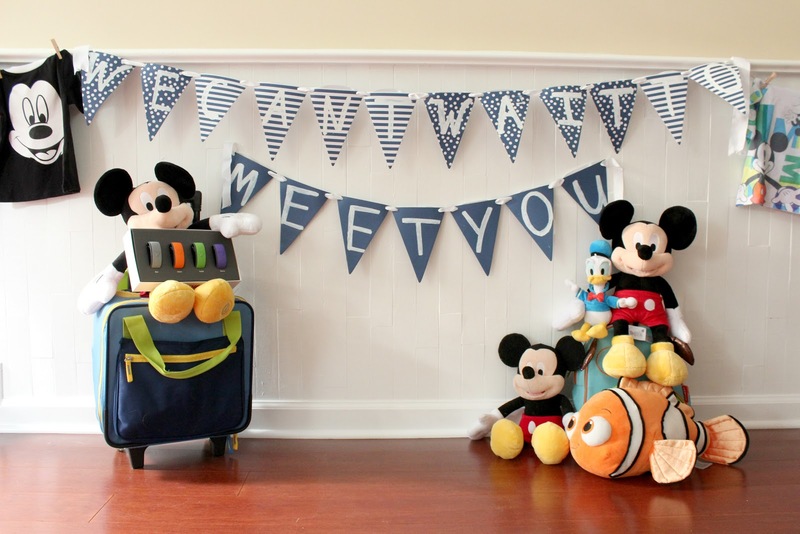 I could not be happier with how everything turned out. Now I find myself walking in here just because and really using it as my own little retreat. Of course the boys enjoy playing in here as well and going through all of my stuff. They are seriously too cute and you have to scroll down to see them in my hats. We've even had story time in here on my new bench and it's funny to think that an organized closet can create sweet memories. 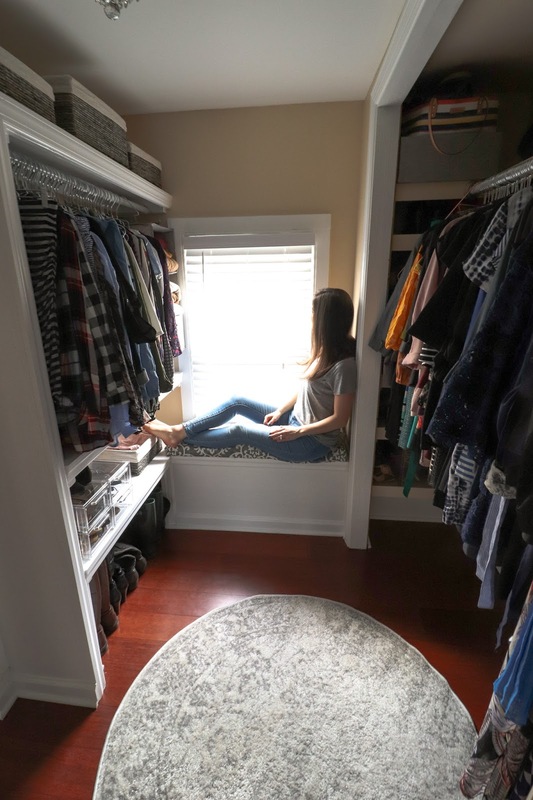 In addition to utilizing all of the amazing organizational resources The Container Store offers, I also added in a second clothes rod, shelves, a bench, and found ways to properly utilize what was really just dead space before. I also got a large mirror and did a little DIY project to my jewelry box, and had my sister paint me this awesome picture that hangs above it. I loved the chandelier that I had in there and felt that it gave it a shabby chic feel, but realistically, it was too big for the space and hung really low. We decided to switch it out for a fixture that was better suited for the space and I love it just as much. You know what I also love? My new rug that compliments everything and pulls the room together. 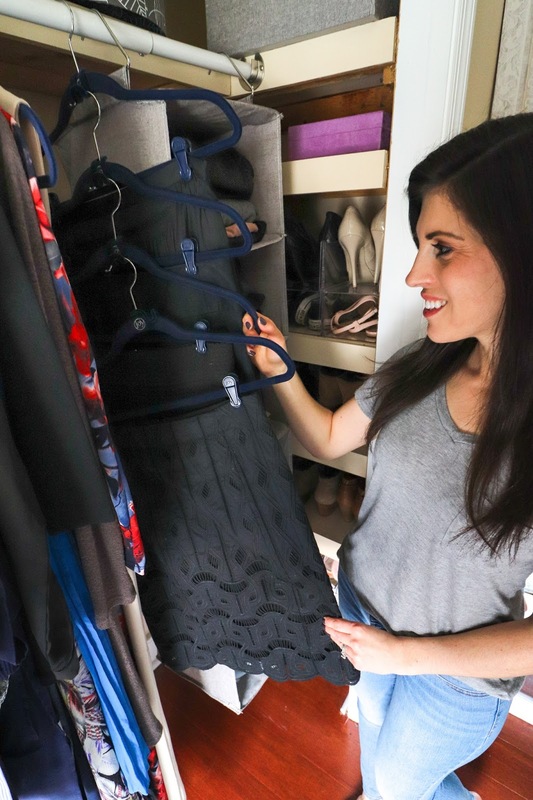 The Container Store's closet sale is going on through May 13th, with hundreds of closet organization essentials (many of my favorites here) for 25% off. I was able to maximize this space far beyond what I thought was possible. Before, I used to have my sweaters and dress pants just folded on some of those smaller shelves. My shoes were pilled up and stacked on top of each other because I could only fit four pairs across on one shelf. My top shelf had purses randomly tossed up there, next to my hats, and I even found a few pair of shoes up there as well. Now, my lovely hat boxes are the perfect spot for my hats and save me a lot of shelf space. I also love these purse bins that have freed up so much space for me and I love how organized they are now. I can't say enough good things about these huggable hangers. 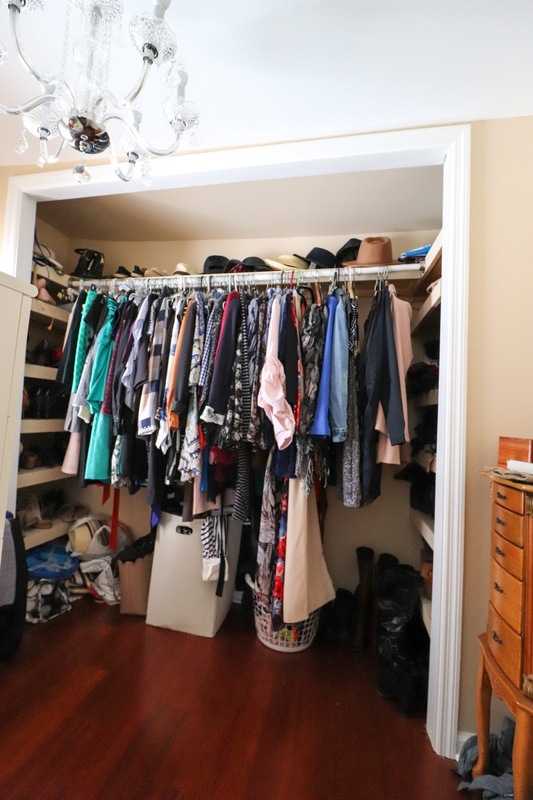 They have been space changing in my closet and I love that they also have cascading mini hooks that you loop through the top of the hanger and you can hang multiple pieces cascading down. This has been perfect for my cardigans and skirts. I was also able to free up so much more shelf space by using the sweater organizers with both three compartments and six compartments. Now let's talk shoes. I realized I have a lot of shoes, and some of them that I haven't worn in years. 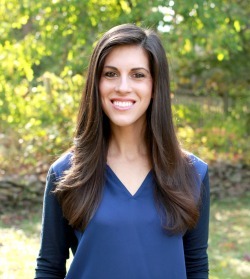 I'm not so sure my days of strutting around in six inch heels will be happening very often. This was a great time for me to go through things and find a lot to donate. 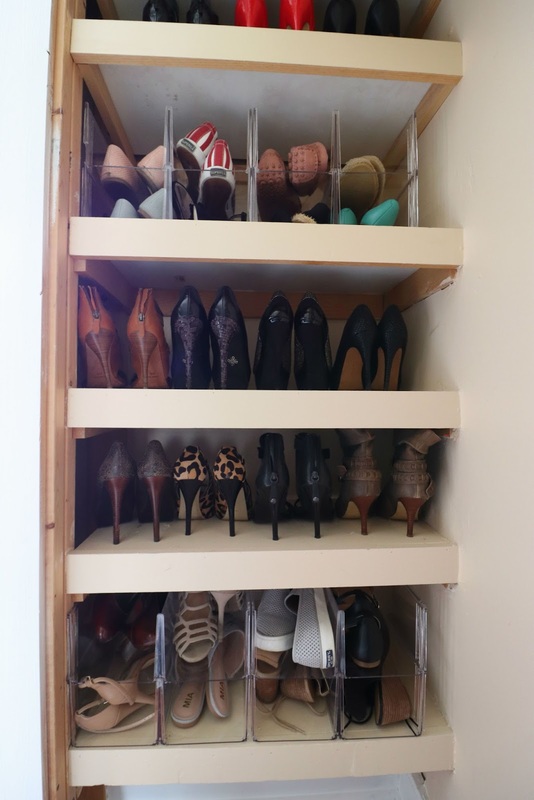 I wish I would have come across these stacking shoe bins sooner. I doubled my space on some of my shelves that I could previously only fit four pairs across. 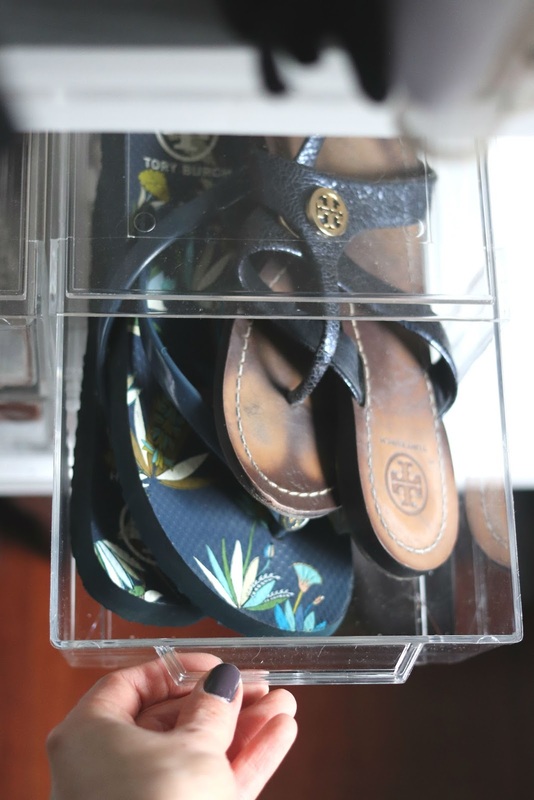 I also love these clear shoe drawers and was able to fit two pairs of my flat sandals in them maximizing my space even more. I think what I realized throughout all of this, is that you don't necessarily need a huge space to feel organized. 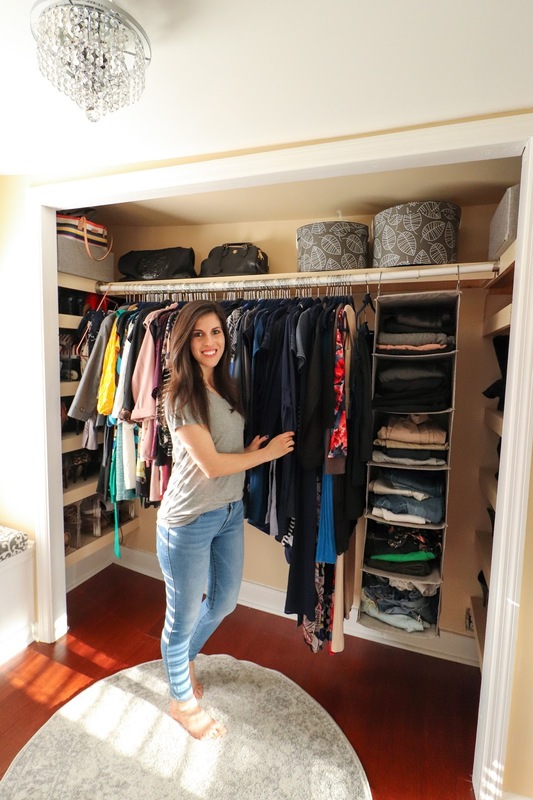 It's about maximizing and really organizing the space you already have to work with. 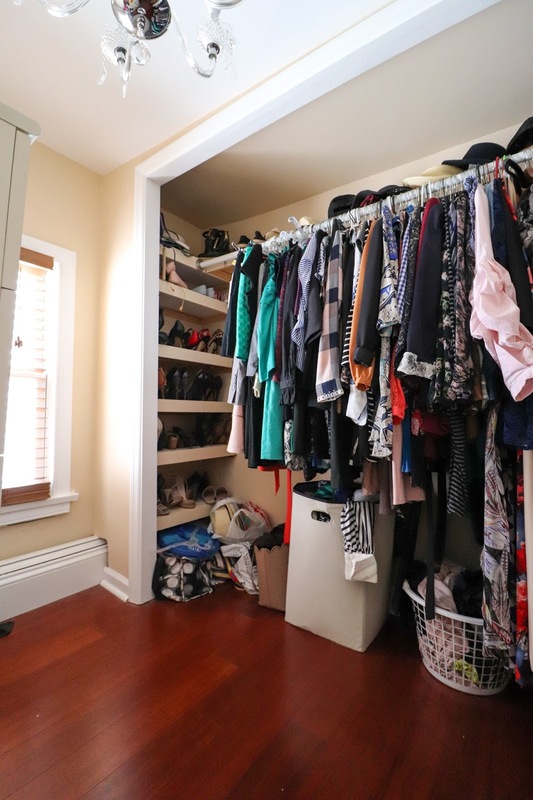 In my closet, I still only have two clothes rods, which may seem like a lot, but in reality, it's not. 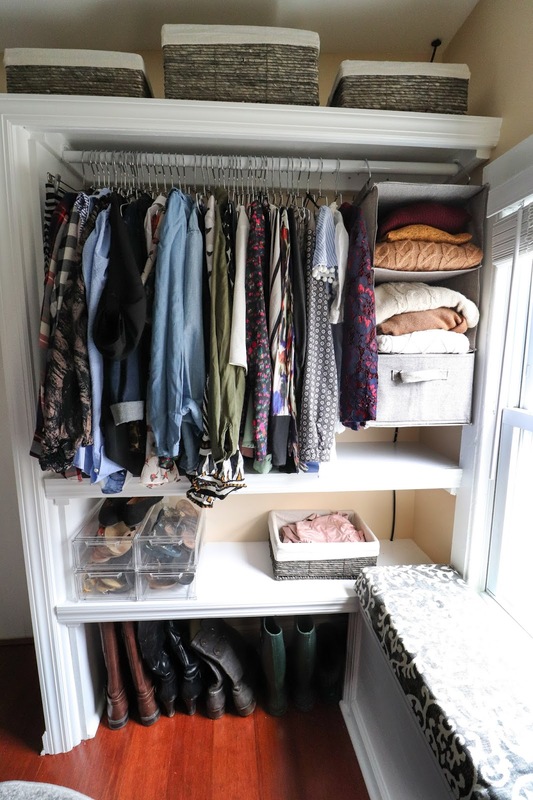 This pushed me to think about ways I could still organize things that maybe didn't need to be hung up and could free up some more hanger space for me. That's when these store baskets really came in handy and were a great solution for that. I also love how they look on top of my shelf and add some dimension to the room. I will say that having things organized really changes the way I view things. We're hoping to tackle even more projects and find ways to make things more functional. It makes life so much easier when there is a place for your things and you actually know where to find them. Dare I even say this might help me be more motivated to get my laundry skills in order. Maybe I'm getting ahead of my self here, but we're working on baby steps.